Big brands Cuisinart, KitchenAid and Breville each earned a spot on the list. After spending 50 hours researching food processors, interviewing experts, and conducting nearly four years of long-term testing, we still think the Cuisinart Custom 14-Cup Food Processor is the best choice for most home cooks. Its simple, pared-down design makes it easier to use and clean than models with more settings or multiple bowls, and we found it to be built more solidly than other processors in this price range. 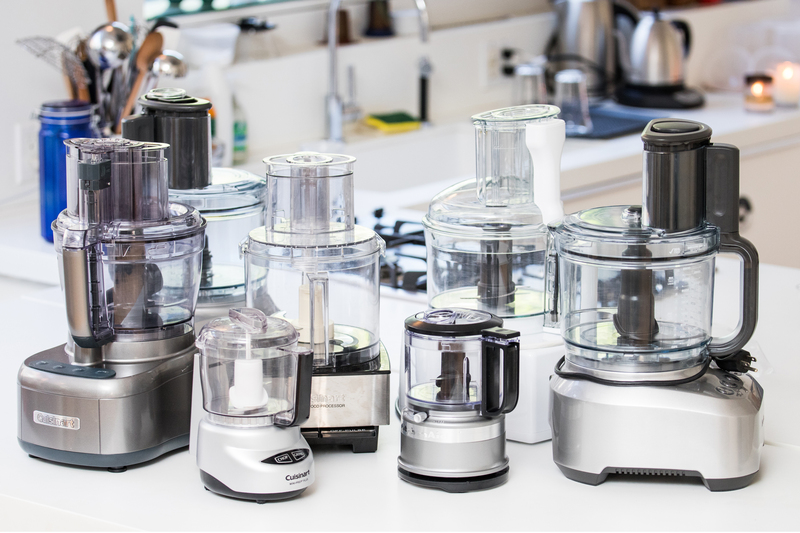 In our tests, the Cuisinart Custom 14-Cup Food Processor tackled a multitude of chopping and shredding tasks exceptionally well. 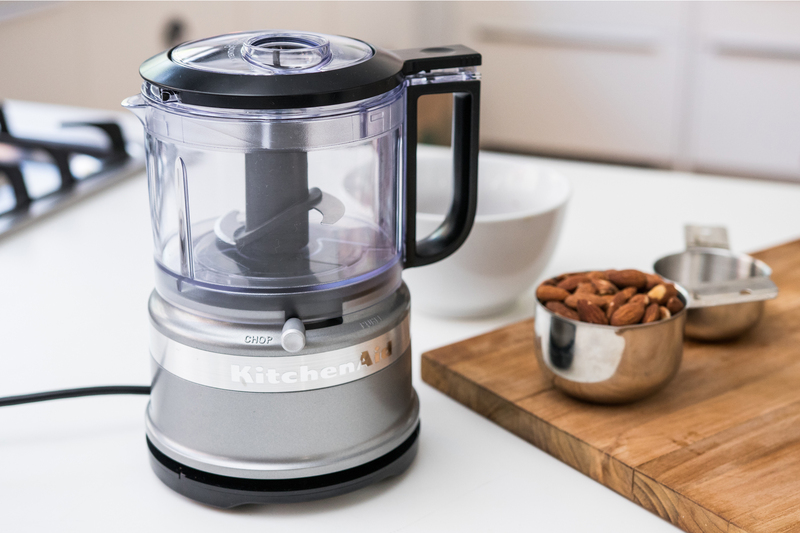 A food processor is the best tool for quickly performing a variety of chopping, slicing, and shredding tasks—such as chopping nuts, slicing vegetables, and shredding cheese—that would be more tedious and time-consuming by hand. Food processors are also handy for blending wet ingredients (like tomatoes for pasta sauce) or for preparing homemade mayonnaise and vinaigrettes. However, if you want to puree velvety soups or crush ice for smoothies, you'll need a blender. At its most basic, a food processor consists of a work bowl that sits on a motorized driveshaft. The bowl's lid has a feed tube for inserting food to be chopped, diced, sliced, ground, grated, or even kneaded (in the case of dough). Most food processors come with S-shaped blades and various disks for grating and slicing, but a host of other attachments—such as julienne disks and citrus juicers—are also available. The experts we interviewed all agreed that an 11- to 14-cup processor is most useful for most cooks, though you may also be interested in mini choppers for smaller jobs. These mini food processors have bowls ranging in size from around 1½ cups to 6 cups, but the highest-rated ones hover around 3 cups. For our 2017 update, we chopped carrots, onions, tomatoes, parsley, and whole almonds in each food processor to gauge evenness of texture. For the processors that came with a disk for grating, we used them to shred soft mozzarella cheese. We tested each full-size processor to see if its motor could withstand the rigors of kneading pizza dough. We also made a 1-cup batch of mayonnaise to see how quickly and evenly the machines could produce a stable emulsification. Finally, we cleaned the bowls, lids, disks, and food pressers of each model by hand eight times. For the fourth year in a row, we think the reasonably priced Cuisinart Custom 14-Cup Food Processor is best for most people. It excelled at every task we attempted, and does so without any unnecessary extras—it comes with only a stainless steel chopping blade and disks for shredding and slicing that can conveniently stow inside the mixing bowl. Unlike some other models we tested, the Cuisinart Custom's base remained in place on the counter while running, even when processing double batches of dough. 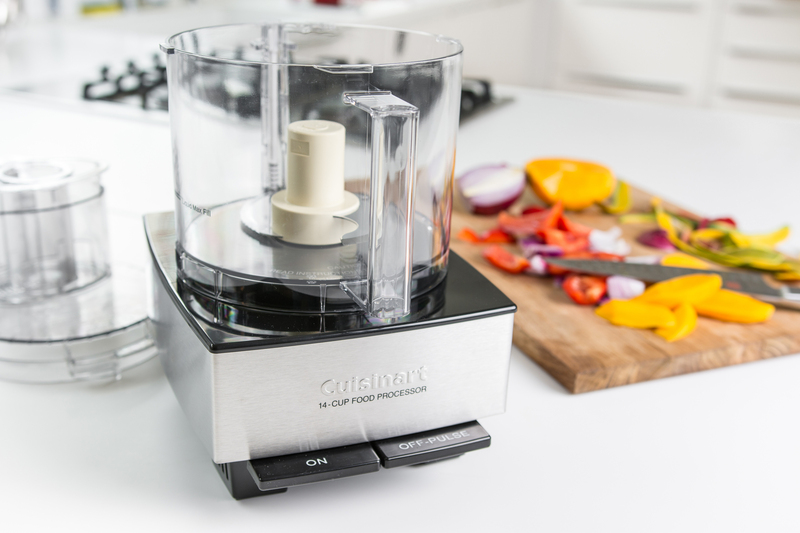 The Cuisinart Custom chopped vegetables and herbs just as skillfully as more expensive models. In our tests, it evenly chopped tomatoes and shredded soft mozzarella cheese. It made a firmer, more stable mayonnaise than other full-size models we tested. It also effortlessly kneaded pizza dough, our most motor-intensive test. The only task the Cuisinart Custom didn't excel at was chopping nuts, as it left a handful of large pieces. The affordably priced KitchenAid 3.5 Cup Mini Food Processor offers the best value and performance we've found in a mini chopper. It evenly chops a range of ingredients, including tough jumbo carrots. In our tests, it even performed better than the mini-bowl attachments that come with some of the full-size processors. Because it's so compact and doesn't come with any unnecessary accessories, the KitchenAid 3.5 Cup Mini Processor is easy to clean and store. It weighs 2 pounds, just enough to keep it from stuttering around the counter while in use. The Mini Food Processor can't make bread dough or shred cheese, but it's great for completing basic tasks quickly. The KitchenAid produced more even textures than the other mini processors we tested and did so quickly. We found it had no trouble chopping onions, a quartered tomato, parsley, and even carrots. It also excelled at emulsifications, and we thought it was the easiest food processor of any size to use for making mayo. However, the KitchenAid did have some trouble chopping whole almonds. 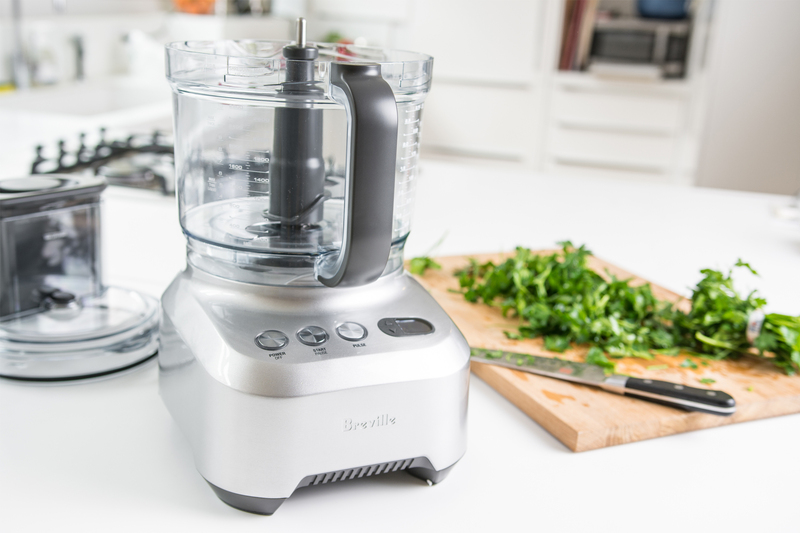 The pricey Breville Sous Chef was hands down the best performer in our testing. It offers extra power, a bigger blending bowl, more attachments than most people need, and nicer features. It chopped vegetables, kneaded dough, and shredded mozzarella as well as the Cuisinart Custom did, and it excelled at slicing. The Sous Chef powered through an entire russet potato in less than a second—noticeably faster than any of the other models. It evenly chopped nuts, tomatoes, and onions, and shredded soft mozzarella cheese too. We liked the Sous Chef's 2½-cup mini bowl better than its competitors', especially for mincing parsley. However, it made a slightly looser mayonnaise than the other models we tested, and the mini-bowl insert did not chop almonds as evenly as we would have liked.